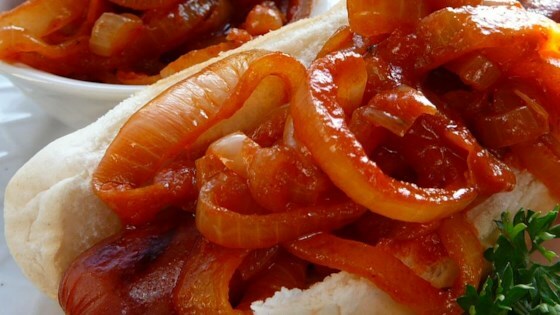 "I love the push cart hot dogs, mainly because of the onions they serve on top...so I mixed and matched many different ingredients until I came up with the perfect combination for this recipe! This tastes just like the kind of onions I often would get from my favorite hot dog stands!" Heat the corn oil in a skillet over medium heat. Stir in the onion; cook and stir until the onion has softened and turned translucent, about 5 minutes. Stir in the hot sauce, yellow mustard, sugar, chili powder, salt, black pepper, and cayenne pepper. Reduce heat to medium-low, and continue to cook for about 5 minutes. Stir in the water and tomato paste; simmer until liquid has reduced, about 20 minutes. See how to make sweet, beautifully caramelized onions. I put this on brats. Love onions, love these X 10. I'm thinking on hamburgers or maybe in hamburgers, both? My hot sauce was HOT so this had a nice burn. Thanks! I made these onions according to the recipe. They are wonderfully spicy. I enjoyed them with saurkrout on a boiled hotdog. Thank you LilLian for sharing this simple tasty recipe. My husband and I loved these onions! A great spicy topping for a hot dog!